(SKNIS): The developmental plans for the New Sandy Point Recreation Ground, which saw the installation of a professional outdoor sport lighting system, and will see the construction of tennis courts, a play area for children and the refurbishment of the pavilion, has received a helping hand from the Republic of China (Taiwan). 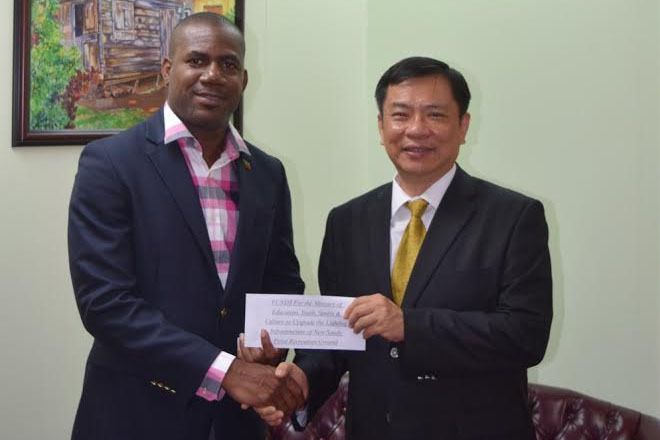 On Tuesday (April 26), Resident Ambassador, His Excellency George Gow Wei Chiou, presented a cheque for more than EC$339,000.00 to assist in defraying costs of the EC$1.8 million lighting project that was completed in late February this year. Work on the other areas is expected to commence shortly. “It’s my pleasure today to handover the support,” Mr. Chiou said, at a brief ceremony at the Office of the Deputy Prime Minister and Minister of Sport, Honourable Shawn Richards. He added that this cooperation project follows on the heels of a similar gesture in 2015 to upgrade the outdoor lights at the Warner Park football stadium. Residents of Sandy Point and nearby communities have taken advantage of the lighting at the new recreation ground and can be seen engaging in a variety of sports, exercises and other activities at night. The ambassador explained that this means more time can be spent doing an actual activity as opposed to driving a long distance to another community to carry out the function. Deputy PM Richards, who is also the Parliamentary Representative for Constituency #5 which includes Sandy Point, said Taiwan has been an “invaluable partner” to the twin island federation. After accepting the cheque from Ambassador Chiou, Deputy Prime Minister Richards handed it over to Stanley Knight, Permanent Secretary designate in the Ministry of Culture, Youth and Sports.